Buff and Shine's Uro-Cell Foam Pads are designed for a wide variety of polishers and buffers, including standard dual action and random orbital machines, gear-driven DAs like the FLEX XC3401VRG, and rotary (high-speed) polishers. Red Uro-Cell Pads - for final finishing and wax/sealant application. These pads are made of dense finishing Euro foam that yields great chemical dispersion for even results. The pads have low "mechanical" ability, meaning they produce minimal action on the paint. Thus they are excellent for final finishing using finishing or swirl-removing polish, without worry of adding any swirls or orbital haze. They are also excellent for applying protective products like wax or sealant to the paint surface once the buffing and polishing steps are done. Red pad is for final polishing and wax/sealant application. Closed-cell foam reduces the amount of pad absorption. Keeps more product on the surface of the pad. Very easy to clean with just water. The Red Uro-Cell Foam pads has low "mechanical" ability, meaning they produce minimal action on the paint. Thus, they are excellent for final finishing with your favourite fine finishing polish. With these pads you don't have to worry about adding any swirls back into the paint. 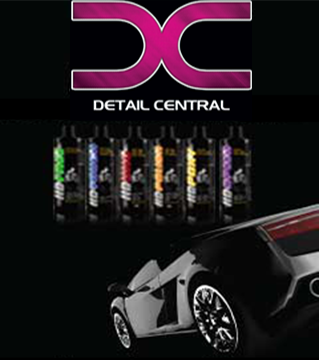 They are also excellent for application of your favourite wax or sealant. Buff and Shine's Uro-Cell Foam Pads are made from a closed-cell European foam that yields more efficient buffing, quicker paint correction times and lowers your chemical costs. A benefit of the closed-cell foam is chemical savings. Because your compound or polish does not readily soak into the foam, less product is required to do the same amount of work. Less saturation of chemical into the foam pad results in less wasted product. You will also find that because the product is not soaking into the pad, the performance of the pad and chemical is consistent for a longer period of time between re-application of product, so your "dollop" of product doesn't wear out as quickly. Buff and Shine Uro-Cell foam pads work fantastically with water based, compounds and polishes. These pads bring out the best performance from these products, providing even dispersion across the pad and vehicle surface. Cleaning these pads is very easy! Since your compound or polish does not soak into the pad, you can simply clean these pads with water or quickly with your favourite pad-washer. These pads are designed for use on dual action polishers, random orbital polishers, forced rotation dual action polishers and rotary polishers. You do not want to use them with a long-throw polisher. WE DO NOT recommend using the Uro-Cell pads with long-throw or long-stroke DAs.